City in Moravia, with about 5,600 inhabitants. The old ghetto of Holleschau still forms a separate township, and contains therefore a German interdenominational school, which is mostly frequented by Jewish children. The Jewish community numbers 1,500. In 1560 the synagogue was rebuilt by permission of Henry von Sternberg, the lord of the manor. The war of Bethlen Gabor against Ferdinand II. (1622) entailed much suffering upon the community, due to Hungarian troops. Twenty-one years later the community was plundered by the Swedes. At a synod held at Holleschau in 1653 the old statutes for the Jewish communities in Moravia ( ) were for the first time revised and amended. In 1682 the Jews were forbidden to appear in the market-place during a procession. During the flood of 1686 hundreds of graves were obliterated, the stones being washed from their original places. In 1741 the community was laid under contribution by the Prussians, and in 1742 it was ordered to pay, within a fortnight, 2,301 gulden as war-tax; the constant exactions of the war left the congregation burdened with a debt of 40,000 florins. 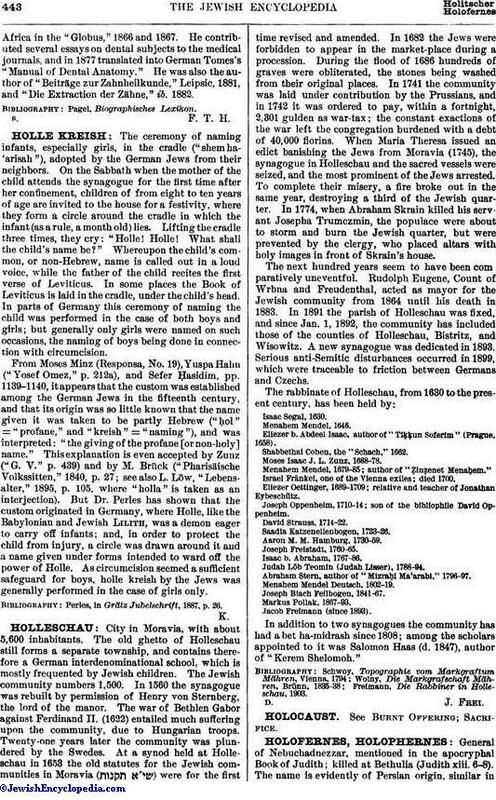 When Maria Theresa issued an edict banishing the Jews from Moravia (1745), the synagogue in Holleschau and the sacred vessels were seized, and the most prominent of the Jews arrested. To complete their misery, a fire broke out in the same year, destroying a third of the Jewish quarter. In 1774, when Abraham Skrain killed his servant Josepha Trumczmin, the populace were about to storm and burn the Jewish quarter, but were prevented by the clergy, who placed altars with holy images in front of Skrain's house. The next hundred years seem to have been comparatively uneventful. Rudolph Eugene, Count of Wrbna and Freudenthal, acted as mayor for the Jewish community from 1864 until his death in 1883. In 1891 the parish of Holleschau was fixed, and since Jan. 1, 1892, the community has included those of the counties of Holleschau, Bistritz, and Wisowitz. A new synagogue was dedicated in 1893. Serious anti-Semitic disturbances occurred in 1899, which were traceable to friction between Germans and Czechs. Eliezer b. Abdeel Isaac, author of "Tiḳḳun Soferim" (Prague, 1658). Shabbethai Cohen, the "Schach," 1662. Moses Isaac J. L. Zunz, 1668-78. Menahem Mendel, 1679-85; author of "Ẓinẓenet Menaḥem." Israel Fränkel, one of the Vienna exiles; died 1700. Eliezer Oettinger, 1689-1709; relative and teacher of Jonathan Eybeschütz. Joseph Oppenheim, 1710-14; son of the bibliophile David Oppenheim. Aaron M. M. Hamburg, 1730-59. Judah Löb Teomin (Judah Lisser), 1788-94. Abraham Stern, author of "Mizraḥi Ma'arabi," 1796-97. In addition to two synagogues the community has had a bet ha-midrash since 1808; among the scholars appointed to it was Salomon Haas (d. 1847), author of "Kerem Shelomoh." Freimann, Die Rabbiner in Holleschau, 1903.